Hair fall is a common issue these days. We see people and most specifically ladies banging their heads with disappointment every time they comb or shampoo their hair. Most of us adopt homemade remedies but it is not possible for busy schedulers to fit in some extra time in their schedules. 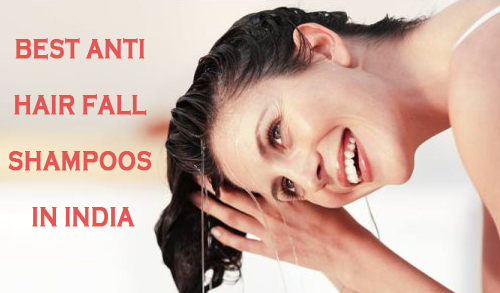 Therefore, a lot of anti hair fall shampoos are launched in the market to solve this problem. Some of these include natural ingredients to help you get back the lost strength and keep your hair fresh. L’Oreal total repair 5 Shampoo treats hair problems such as dull hair, spilt ends, dryness, rough hair, and breakage to bring the lost shine, moisture and strength of your hair. The unique formulation of ceramide cement repairs from roots to tips and leaves a sweet fragrance after every wash.
Jovees Henna and Ginseng Anti Hair loss Shampoo use henna and ginseng as its chief ingredient. This combination works wonders in the scalp by cleansing it from root to tip. Hair fall is kept under control and the soft fragrance keeps you fresh. Pantene anti hair fall shampoo is enriched with the goodness of Pro-V Science formula to help reduce hair fall. It makes your hair soft and keeps its healthy and strong by protecting it from pollution. Sunsilk hair fall solution shampoo includes the goodness of unique soya Vit complex which prevents premature hair fall and breakage. It nourishes your hair from roots to tips making it soft and healthy. Though it does not give much lather, it cleanses your hair from the root. Dabur Vatika root strengthening shampoo contains coconut milk and goodness of real almonds that keeps your hair silky soft and smooth and work against hair fall. It also brings back the lost moisture in your root. Himalaya anti-hair fall shampoo is made from Eclipta Alba and Butea Frondosa extracts that works effectively on the roots. It helps irradiate problems such as itchy scalp and eruptions with the Pongamia content. Regular use brings back your lost strength. Fiama Di Wills anti hair fall shampoo is all about the goodness of Brazil nut that is effective for hair restoration. Regular use makes your hair soft, silky, smooth and bring back your lost shine and luster. It prevents hair fall to a great extent. Vaadi Herbals Amla Shikakai Shampoo contains active natural ingredients that effectively cleanse the scalp. The shikakai extracts strengthen hair follicles and amla retians hair loss. It is one of the trusted hair fall product in the market. Dove damage therapy shampoo claims to reduce hair fall in 2-3 weeks. The sweet aroma and the micro moisture serum strengthen hair follicles reduce hair fall and maintain its luster. Patanjali Kesh Kanti Shampoo by Baba Ram Dev contains naturally rich ingredients like Amla, Bhringraj, Shikakai, Giloy, Jatamansi, Haldi, Neem, Reetha, etc. It work miracles on hair fall and add volume to your hair. Your hair becomes silky soft and lovable. Check out the best anti-dandruff shampoo in Indian Market. Find the Top Ten List. I was worring about my hair fall……. I was worring about my hairfall plz tell me which shampoo use ? I lost sooooo many hair. After my delivery my hair fall started so I changed shampoo from dhathri to dove hair therapy now its worsen den before. I dnt no wat to do. I want thick, soft, silky hair. Plz help me. I prefer Dove damage therapy shampoo. It’s cool and reduced hair loss.